How eco-friendly are your winter woolies? Richard Parker pitching his heart out. A live audience watched human factors researcher Dr Richard Parker deliver his first ever pitch for research funding to a panel of three judges. 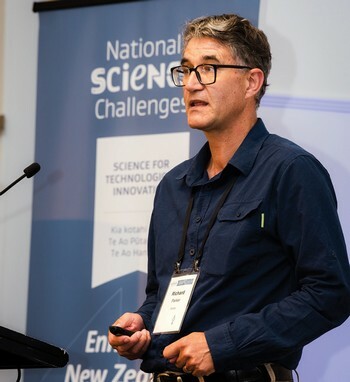 Richard was taking part in a Dragon's Den style pitching competition run by the Science for Technological Innovation National Science Challenge (SFTI NSC), and he won $10,000 for his efforts. The SFTI NSC is charged with accelerating New Zealand's hi-tech economy. It also invests in capability building to help researchers expand their communication skills to promote the value of their ideas and learn how to tailor their communications to their audience. This includes attending a 'pitching workshop' with pitching guru Daniel Batten. Richard's pitch, ‘Robots for Forestry’, drew on his own experience as a professional tree feller-turned human factors scientist. He says, "I was hit by a tree, it shattered my pelvis and my femur, I had three operations and spent two years on crutches. It cost the health system a fortune". This experience left Richard feeling that there had to be a safer way to harvest trees. Years later, working for Scion, Richard's past motivated him to create the tree-to-tree robot. This robot would allow tree felling without risking human safety and also minimising the impact of tree felling on the landscape. Richard says, "Robots are already being used in a number of high-risk industries like mining, nuclear decommissioning, and oil and gas production. I'll be using the winnings from my pitch to learn from the experiences of these industries, and apply it to forestry in New Zealand". The development of the tree-to-tree robot has also been supported by the Steepland Harvesting Primary Growth Partnership funded by the Ministry for Primary Industries.